Take a square of pretty paper, a little card stock or colored paper, and a couple of Valentine stickers; fold with care – and voila – you’ve made a secret Valentine to give your best friend. For such a simple origami idea, this little secret Valentine has lots of potential. 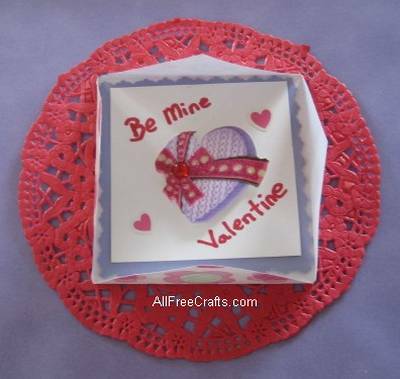 Mount it on a paper doily (as shown), or use flatter stickers and mount it inside a greeting card. 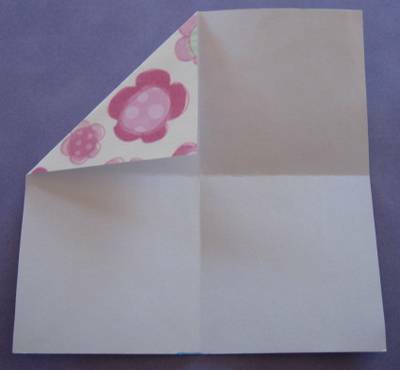 You could even cut a window in the front of the card to provide a peek at the square Valentine mounted inside the card then decorate the card itself with matching stickers. 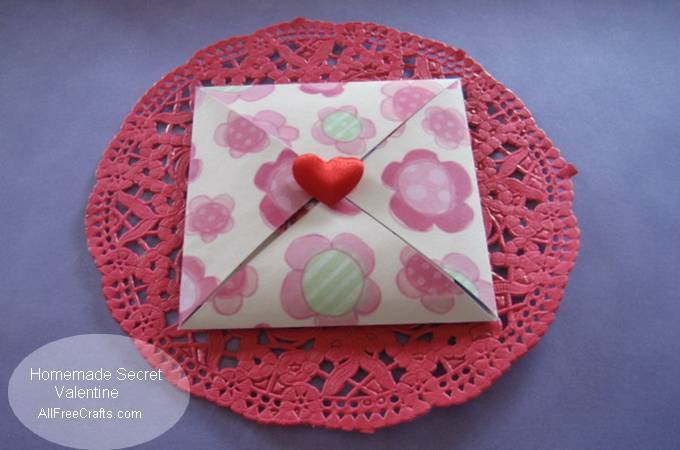 If you are going to mount your secret Valentine on a doily (or a greeting card), you must make the folded square which holds the Valentine the right size to fit the centre of the doily . If your doily is six inches in diameter, use a ruler to measure and draw a five inch square on decorative paper. Cut out the square. First folds on the square paper. Next, take the top left-hand corner and fold it to the center. Press the crease firmly. Now we come to the fun part: filling your Valentine with the secret contents. I made a little Valentine card that fits just inside the square, including a three-dimensional scrapbook sticker with a rhinestone embellishment that I surrounded by tiny heart stickers. I also wrote “Be My Valentine” in red marker. 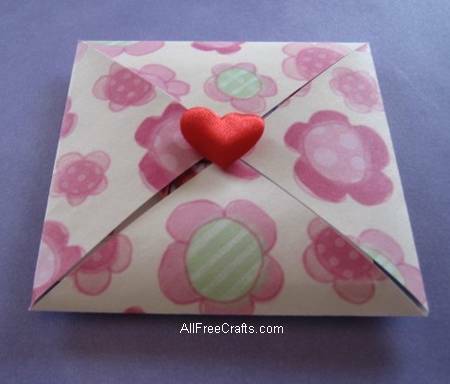 But you could use or create any thin card or paper Valentine that will fit inside. Be imaginative, and craft a card that will suit the person receiving your Valentine. 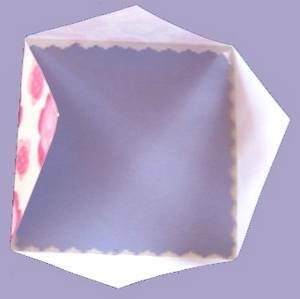 If you want something that looks like my Valentine, then cut a square of colored card or stiff paper into a square that will fit just inside your origami folder, so make it about a quarter of a inch smaller than the inside square dimension. You can use straight edges or cut around the square with pinking shears or decorative edge scissors for a lacy effect. Now it’s time to include a message to your Valentine. 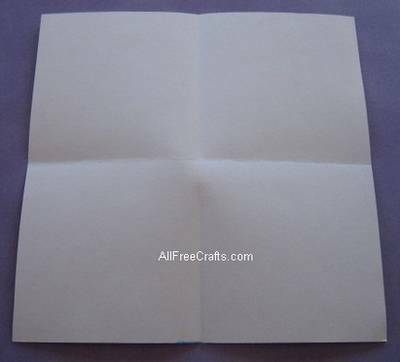 Cut a piece of white paper slightly smaller than your card square. Place a large sticker in the middle. Write your Valentine message and add smaller stickers in the spaces around it. 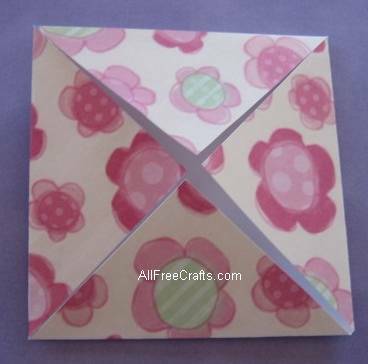 Glue the message to the colored square then place your Valentine inside the origami square folder. Fold over the corners of the original origami square and secure the center with a sticker. I used a little satin heart with two-sided tape on it, but any heart-shaped or Valentine theme sticker would work perfectly. At this point, your secret paper Valentine is complete and perfect for handing out to friends in your class. But make a special one for your mother by gluing it to a pretty paper doily. She’ll treasure it forever!